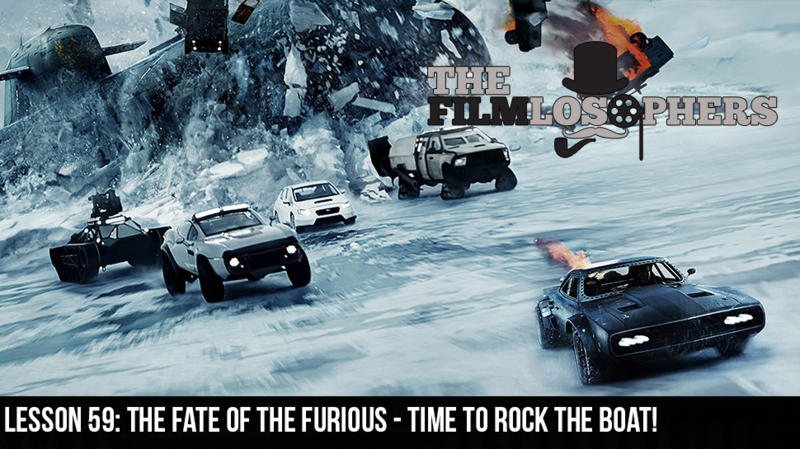 Lesson 59: The Fate of the Furious – Time to “Rock” the Boat! The Filmlosophers, Eddie Villanueva and Chad Riley, blow it up (like the record-setting global box office haul) with this week’s review of The Fate of the Furious (2017), starring Vin Diesel, Dwayne “The Rock” Johnson, Charlize Theron, Tyrese, Ludacris, Jason Statham, Kurt Russell and several others. How did the crew fare without Paul Walker, and what did/didn’t work about Dom Torreto’s double-cross? In movie news, we discuss the long-awaited reveal of Josh Brolin as Cable in Deadpool 2 (2018).